The RISD Museum of Art has produced a short video to demonstrate the process of engraving and printing on copper by hand. The video was evidently produced with historians of the early modern period (c.1450 – 1650) in mind but it’s content is equally applicable to the long eighteenth-century, as the process of intaglio printing remained fundamentally the same for well over 300 years. It’s only 7 minutes long and well worth a watch. Although his is not a name we typically associate with images of warfare, Thomas Rowlandson lived at a time when war was a prominent feature of daily life for many people. In the decades between Rowlandson’s birth in 1757 and his death in 1827, Britain was to spend no less than 35 years engaged in wars with other European powers. The most significant of these being the conflict against Revolutionary France which was fought on almost continual basis from 1793 until the final defeat of Napoleon in 1815. The demands that the escalating modes of contemporary warfare placed upon the British state and society meant that, by the start of the nineteenth-century, Britain had effectively become a nation under arms, with over 1 in 5 of all men enlisted in the military and the economy dominated by wartime production. There would probably not have been a household in the land that was far removed from someone who was either serving in the armed forces, or whose livelihood depended in someway upon the supply of Britain’s fleets and armies. So while warfare may not have been a subject that naturally appealed to Rowlandson’s convivial temperament, it’s almost inevitable that it would creep into the works of an artist who delighted in caricaturing the day-to-day aspects of the world around him. The painting is undated but I strongly suspect that it was done sometime during 1798 or 1799. These were years in which Rowlandson was commissioned to produce a number of watercolours and engravings on behalf of the London & Westminster Light Horse Volunteers, a socially exclusive militia regiment whose ranks consisted of nobles, bankers, lawyers and wealthy merchants. The commissions came through Rowlandson’s close friend Henry Angelo, who had acted as fencing master to the Light Horse Volunteer’s commanding officer and was hired to produce a manual on the art of swordplay for the Volunteers to study. Although Rowlandson didn’t serve in the regiment, we know that he was present during at least one of their training exercises and it is likely that his connection to Angelo allowed him to mix freely amongst its ranks. This would no doubt have afforded him the opportunity of securing private commissions to produce paintings such as this for Light Horse Volunteers who were keen to commemorate their time with the regiment. The painting shows a light company of cavalry, probably the Light Horse Volunteers, charging headlong into a massed formation of enemy infantry. 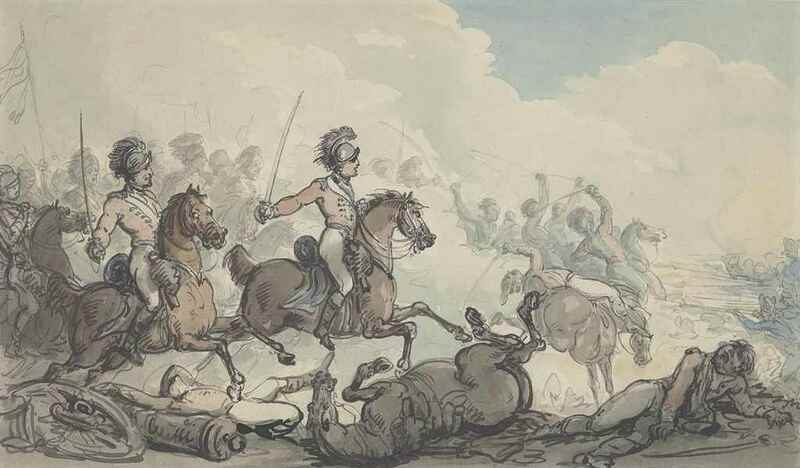 The figures of the two cavalrymen who are picked out in the foreground strike a suitably dashing note as they sweep by us in their immaculately tailored uniforms, but look beyond this and Rowlandson’s message becomes more ambiguous. The horses of the two principle figures ride over the body of a fallen comrade, whose own mount writhes in agony on the floor, while another wounded cavalryman lays dying in the foreground-right. To the rear we see that the enemy infantry has just unleashed a crashing volley of musketry at point blank range, blowing several men clean out of their saddles. The scene is frozen at the very height of the battle, making it unclear whether we are about to witness a glorious victory or a bloody rout. It’s almost as if Rowlandson is seeking to prick the pomposity of wealthy weekend warriors like the Light Horse Volunteers, by reminding them of the realities of the battlefields that many of them would never see. A Merry Christmas Day in the Watch House. Published by Thomas McLean c. 1830. A young man is confined in the watch house for fighting with the police. 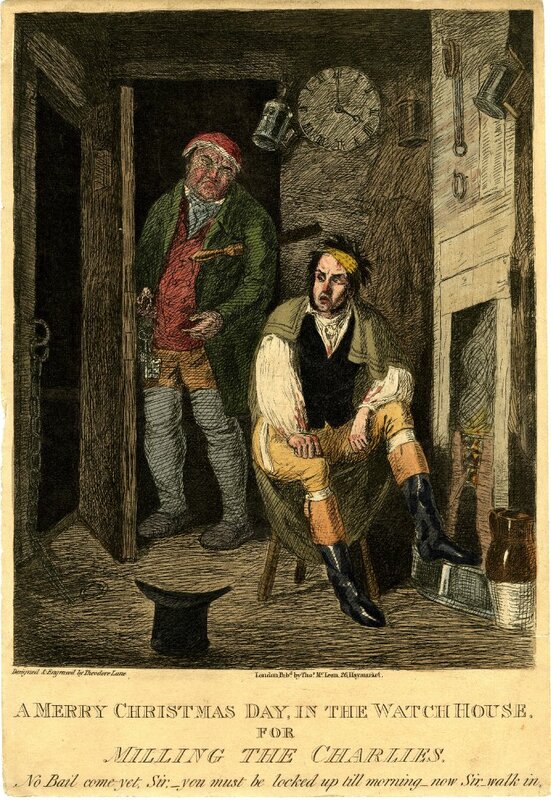 Thomas McLean was one of early nineteenth-century London’s leading satirical printsellers. He first began publishing in 1824 and by the end of the decade had already eclipsed many of the older printselling firms that had been so closely associated with the ‘golden age’ of caricature in the previous century. His business thrived during the 1830s, monopolising the talents of leading satirical artists such as George Cruikshank, John Doyle and Robert Seymour. 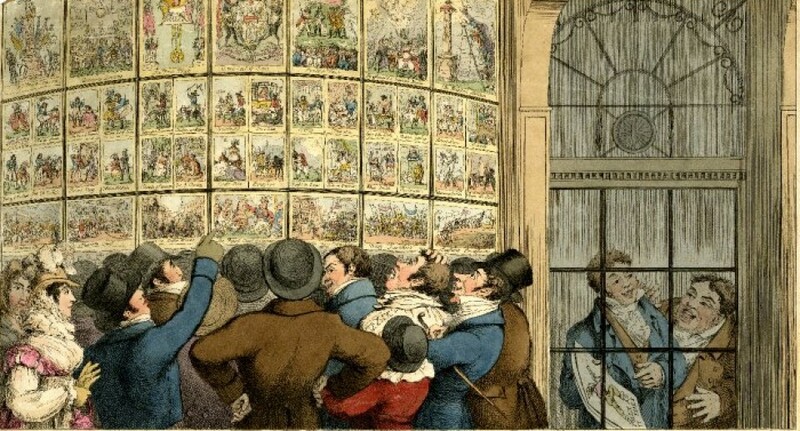 It would eventually evolve into an art gallery after McLean’s death in 1875 and was still trading when Dorothy George sat down to write the tenth volume of the catalogue of the British Museum’s satirical print collection in 1952. Thomas McLean’s customers probably regarded him as the very model of bourgeois respectability, but behind closed doors his family was troubled. Thomas’s younger brothers Edward and Charles had initially worked alongside him in the shop, Edward acting as assistant manager and Charles making picture frames for the display of prints, but Charles’s wayward behaviour was becoming a cause for concern. Matters came to a head sometime in the summer of 1830 when a row, sparked off by “bad conduct” on Charles’s part, resulted in his expulsion from the family business and the house he’d shared with Edward. Charles McLean was to spend the next 12 months living on the breadline in what probably amounted to a world of disreputable drinking dens and filthy doss-houses. By the autumn of the following year his situation had grown so desperate that he turned up on the doorstep of a family acquaintance named James Stanley to beg for help. Stanley was a paintbrush-maker who knew the McLean’s through his business connections with Thomas and Edward. He took one look at Charles’s pitiable state and immediately invited him in, offering him board and lodgings until he was able to get back on his feet. The arrangement evidently suited both men, as Charles McLean was to remain in James Stanley’s house on Dean Street in Soho for a number of months and may even had begun working for him. However by Christmas 1831 it was becoming clear that all was not well in the Stanley household. Things had begun to go missing from around the house, including pieces of furniture and even items of clothing. The contents of James Stanley’s stockroom were also becoming oddly depleted. Initially at a loss to explain the disappearances, Stanley would later claim that he received a tip-off which led him to suspect that Charles McLean and another lodger named Robert Hearn were stealing from him, and then handing the goods over to Edward McLean for safekeeping. He reported the matter to the local magistrate immediately and all three of the suspects were arrested. Searches of Edward McLean’s house and Robert Hearn’s bedroom apparently confirming the allegations by uncovering numerous pieces of James Stanley’s property, as well as pawn tickets for many other items that had already been exchanged for ready cash. An initial hearing took place on 14th January 1832 at the Malborough Street magistrate’s court. Charles McLean was charged with the theft of a bed, a pier glass, a quantity of paint brushes, items of clothing and other property belonging to James Stanley, while his brother and friend were accused of receiving stolen goods. Charles responded to the accusations by going on the attack, denying any wrongdoing and claiming that Stanley had given him the items in question and asked him to pawn them in order to raise some money. He even managed to manoeuvre his landlord into admitting that he had asked him to pawn similar items on a number of occasions in the past. Hearn pleaded ignorance, stating that he had no knowledge of the crime and that he had been unaware that some of the missing items had been hidden in his bedroom. Edward McLean took a similar line, claiming that he had always assumed that the stolen goods were Charles’s own property and appealing to the court to consider “that it was extremely painful for a person of his respectability to be placed in so disgraceful a situation… and he earnestly hoped that the magistrates would not make him responsible for the misconduct of his unfortunate brother”. The presiding magistrate was unsure. Charles’s story and the confessions of the hapless Stanley had introduced enough uncertainty into the proceedings to prevent the case being immediately passed to the crown courts for trial. Charles McLean and Robert Hearn would remain in custody until another hearing could be arranged the following week, while Edward McLean would be allowed to return home on bail. For a moment it may have seemed as though the case was going Charles’s way, but as the trio were about to be led from the courtroom, the arresting officers stepped forward to state that they had carried out a search of Charles McLean’s personal belongings and believed they had evidence that another more serious crime had been committed. The prisoner’s pocket-book had been found to contain bills of exchange and bankers cheques worth many hundreds of pounds that were made out in the names of Charles McLean and Robert Hearn. This included a number of bills of exchange which had been paid out to the defendants by James Stanley himself. Stanley immediately confessed that this was the case but claimed that he had been duped into making the payments by Robert Hearn. Hearn had come to Stanely, knowing he was short of money, and offered to sign over a note of exchange worth 50 shillings if he would consent to put his signature to several other blank promissory notes in return. Stanley, who had never encountered bills of exchange, nor entered into any kind of credit agreement, immediately consented and took the fifty shilling note. He later found that Hearn had added amounts far in excess of fifty shillings to the other bills of exchange and used them to run up debts in his name or simply demand payments of cash whenever he liked. The magistrates in the room now subjected the contents of the pocketbook to a thorough examination, noting that many of the bills had been left blank and that the authorising stamps on some of them appeared to be forgeries. After declaring that they “…had never seen a more regular system of scheming and swindling brought to light” they ordered that the prisoners be returned to the cells pending further investigation. The second hearing, which took place four days later, was not recorded in as much detail as the first. We know that Stanley, Hearn and the two McLeans were all present, that they repeated their original testimony and at the end of the proceedings Charles and Hearn were committed for trial. The charges against Edward McLean were dismissed, but he was bound over to keep the peace for two months, after it emerged that he had threatened to kill Stanley for attempting to ruin him by implicating him in his brother’s crime. McLean and Hearn were duly scheduled to stand trial at the Old Bailey on 16th February 1832 on a charge of larceny. The charge was a serious one and a successful conviction would in all probability result in a lengthy prison sentence, transportation to a penal colony, or even death. The records of the Old Bailey indicate that six other individuals who were convicted of larceny during the same session were sentenced to hang, one of whom was a 17 year old boy accused of stealing a handful of guineas from a fellow servant. The amount in question was paltry when compared with the money that McLean and Hearn were accused of swindling out of their landlord. However the case took another odd twist at this point. The law of the time required that the evidence of a particular case had to be submitted to a Grand Jury for examination before trial. If the jury felt that the evidence against the accused was insufficient then they could refuse to issue the True Bill which was required in order for the trial to proceed. This was not the same as an acquittal, it simply meant that the trial could not take place due to a lack of credible evidence. The charges remained open and local magistrates were at liberty to bring the accused before another jury if further evidence came to light. This is exactly what was to happen in the case of Charles McLean and both he and Hearn subsequently escaped prosecution as a result of the jury’s decision. We can only speculate as to the reasons for this sudden reversal of Charles McLean’s fortunes. James Stanley’s testimony at the first magistrates hearing had revealed that the paintbrush-maker was in financial difficulty and that his dealings with McLean and Hearn were perhaps not as straight forward as he had made out. It is perhaps telling that he did not think fit to mention the payments claimed had been extracted from him until after the magistrates had mentioned the dodgy bills of exchange. Similarly, when one looks at the items that Charles McLean was accused of stealing it becomes difficult to imagine that he could really have taken them without their owner’s consent. The idea that he and Hearn could have surreptitiously maneuvered a bed out of their landlord’s house without arousing suspicion being almost too fantastical to believe. What the affair does reveal is something of the nature of the young Charles McLean and the dubious company he kept. We do not know what happened to Charles in the years immediately after he escaped trial, but it is highly unlikely that either of his brothers would have been willing to welcome him back with open arms. An entry in the 1851 Census possibly holds out some hope of redemption, as it records that a 49 year old man named Charles McLean was then living at a house on Oxford Street with his family. McLean was once again employed as a carver and gilder and had apparently settled into a respectable middle age alongside a wife and their three adolescent children. His trade and address in London’s West End even holds out the possibility of a reconciliation with his eldest brother and a return to the family business. We do not know for sure, but this would have been an ending to Charles’s story that was worthy of its authentically Dickensian setting. The reproduction of print-based satire across other commercial mediums was common throughout the long eighteenth-century. Caricatures that started life in print were often adapted for decorative use on, amongst other things, pottery, textiles, tobacco boxes, and fans. The appeal of these items must in part have been derived from the fact that they often provided a cheaper and more durable alternative to the prints they sought to emulate. This tobacco box on the other hand, constitutes a rare example of an item which was probably far more expensive that the print it was copied from. It is decorated with a beautiful painted miniature copy of a caricature design after Jean-Michel Moreau’s The Troelfth Cake, a French satire on the First Partition of Poland which was originally published in 1773. Collectors of eighteenth-century English caricature may not be overly familiar with The Troelfth Cake as it was not widely reproduced in London at the time, but it was hugely popular in Europe during the mid-1770s. The original version of the print was banned as seditious in Paris and several German states, immediately prompting a rash of unlicensed copies which were published in both France and Germany. One of the most famous of these being produced by the Bavarian artist and engraver Johannes Esaias Nilson of Augsburg. Nilson was working with German and Austrian audiences in mind, many of whom would have been more than happy to see their own nation enriched at Poland’s expense, and he therefore made a number of significant changes to Moreau’s original design. The most notable of these is to the figure of Stanisław August Poniatowski, who stands to the right of Catherine the Great. In the original French version, Stanislaw is seen turning away from the table on which the map of his country is being torn asunder in distress or disgust, as the crown of Poland topples from his head. Nilson changes this completely and shows the Polish king fully engaged in proceedings, calmly staking his claim to the remains of the kingdom. The impression conveyed is therefore one of an amicable diplomatic settlement, rather than an act naked imperial aggression. This theme continues into the portrayal of Frederick the Great, who has had his sword removed so that he is no longer staking his claim to Danzig by skewering it with his blade. The figure of Pheme, the goddess of rumour who hovers above the scene, also carries copies of the manifestos issued by Prussia, Austria and Russia, over the newly occupied lands. 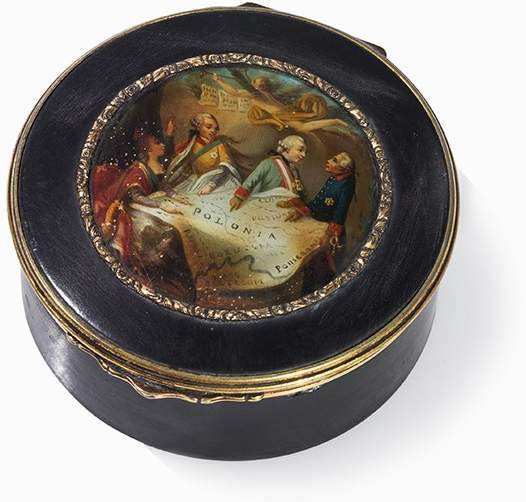 The box is decorated with a copy of Nilson’s German variant of The Troelfth Cake and was therefore probably made in Germany or Austrian sometime around 1775. The exceptional quality of the miniature hints at the possibility that it may even be the work of Nilson himself, who is known to have produced numerous miniatures on wood and ivory. If that attribution could be proven then it would presumably enhance the already considerable estimate of EUR 5,000 – EUR 6,500 that has been placed on this item by the Berlin auction house that will be selling it in a few weeks time.